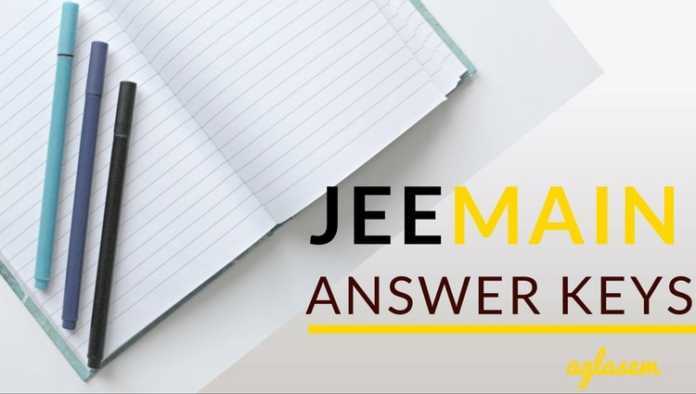 JEE Main 2019 Answer Key – NTA has released official JEE Main Answer Key 2019. The question paper and response sheet is also available. Candidates can either login and download it or simply use the link on this page to get JEE Main Answer Key and Question Paper PDF. The key is open to challenges and the last date to do so is April 16, 2019. Result will be announced by April 30, 2019. Check more details on JEE Main 2019 Answer Key from this page. 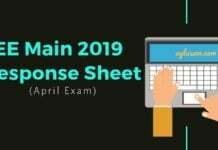 Latest: Download PDFs for JEE Main 2019 Answer Key and Question Paper below. We have downloaded the question paper and answer key of JEE Main 2019 shift 1 and 2, for 5 days. You can download directly download it for your shift from below. You can check the dates for answer key, question paper, and release of JEE Main result from below. Click Here to download JEE Main 2019 Question Paper via Password. National Testing Agency has notified students about the release of the answer key through official notice. Candidates can check it from below. Step-1- First, download the answer key, response sheet, and question paper of JEE Main 2019. Step-2- Next, match if the answer on the response sheet and answer key is the same or not. Step-3- For each correct answer, allocated and deduct marks as per the marking scheme. Step-4- When the candidates do the steps above for all 360 questions the raw marks will be calculated. Add (+) 4 marks for all correct answer. Minus (+) 1 marks for incorrect answers. With the exam now being over, various coaching institutes have released the JEE Main Cut Off 2019. The experts at the coaching centers, after analysing the difficulty level of the paper, predicted that the cut-off of this year can be slightly higher than that of the last year. The candidates can check the expected JEE Main Cut Off 2019 from the table below. Step-1– Click on the link above. There are two links above, for download JEE Main 2019 answer key via application number and password or application number and date of birth. Click on anyone. OR Application Number and Password. Login to download JEE Main 2019 Answer Key via Application Number and Date of Birth. Login to download JEE Main 2019 Answer Key via Application Number and Password. Step-3– After entering these details, at the end of the dashboard, “Challenge Answer Keys” tab is given. Click on it, to download the JEE Main 2019 answer key. Step-4– Following this, the answers will be displayed against each question. The JEE Main 2019 answer key is open to challenges. If a candidate feels that the answer given in the key are not correct then they can submit objects against it. To do so, the candidates have to pay Rs. 1000 per objection. The amount of objection will be refunded if the objection stands valid. 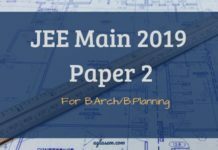 How to submit objection against JEE Main 2019 Answer Key? Click on the link above to access the login. Enter application number and password / date of birth to access the login. Then, in the dashboard, click on “Challange Answer Key” tab. On clicking it, candidates will get to see Paper, Question ID, Correct Question(s), and Objection(s) ID Claimed. After this, the candidates will have to upload the document of proof by clicking on “choose file” button. Lastly, click on “Save your Claims and Pay Fee” button. Once candidates pay the amount of fee, the objection will be submitted. How to Download JEE Main 2019 Answer Key if Forgot Login Details? Candidates who are able to download JEE Main answer key 2019 because they can’t rememb the application number of password need not worry. The login credential can be retrieved. Click Here – to access the login for retrieving the details. Click on, “forgot my application number” and then on ‘Continue’ button. Next, the candidates will get the login and to access it Name, Mother’s Name, Father’s Name, Date of Birth, and State of Eligibility will be needed. When the candidates will enter these details and click on the ‘Submit’ button, the application number will be displayed on the screen. In the next window, click on the link for “can’t access my account”. Then, select the option for “forgot my password”. After this, the candidates need to select any of one of the options – ‘Using Security Question & its Answer you chosen during Form filling or ‘Using a verification code sent via text message (SMS) to your Registered Mobile No’ or ‘Using a reset link sent via Email to your Registered Email address’. Click on the red “continue” button and as per the medium you select, you will get your password back. Can there be wrong questions in JEE Main Answer Key 2019? Yes, for the January attempt exam, it was observed that there were many wrong answers in the JEE Main Answer Key. It was confirmed that there were 22 wrong questions in total in the JEE Main Answer Key. To be fair to the candidates, NTA dropped these questions and gave full marks to the candidates for these questions. As per reports, there were about 9 wrong questions in Physics, 2 each in Chemistry and mathematics for the JEE Main January attempt exam. Once the candidate submit the objection in the JEE Main 2019 Answer Key, the NTA appoints subject expert(s). The subject experts analyses the objection submitted by the candidate and if the challenge is relevant and correct, a change is made in the JEE Main Answer Key. NTA after making the relevant change, if required, then releases a Final Answer Key for JEE Main 2019. The final key is released for Paper 1 and paper 2 separately in pdf format. 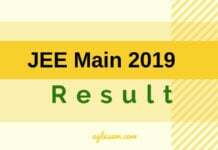 JEE Main 2019 Result is compiled on the basis of the JEE Main 2019 Final Answer Key. The candidates are not allowed to submit any grievance in the JEE Main 2019 Final Answer Key. 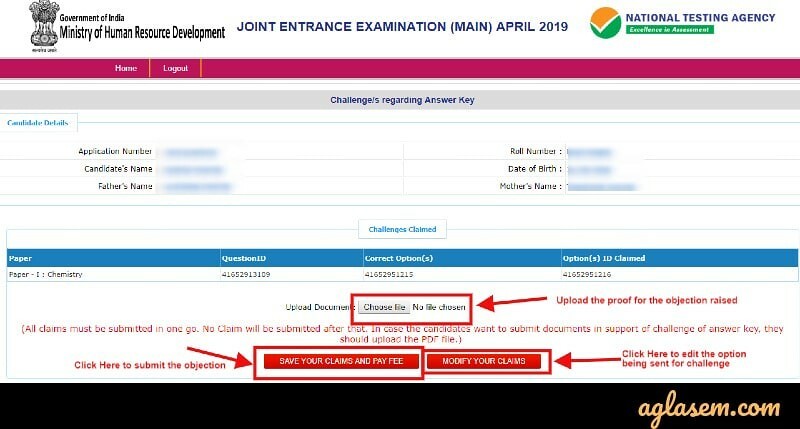 Answer Key for JEE Main April 2019 exam is to be downloaded using the JEE Main Candidate login only. Candidates are also given an opportunity to submit objection(s) in the JEE Main 2019 Answer Key. JEE Main 2019 Result is prepared on the basis of the final answer key. The result for JEE Main 2019 is going to be released online at the NTA website. JEE Main Result 2019 is determined through the process of Normalisation. Since the exam is being conducted on different days in different sessions. Some candidates may get an easy paper while others a tough one in JEE Main 2019 exam. Hence, to ensure that no student is at a disadvantage, NTA adopts the process of normalization for determining JEE Main 2019 results and ranks. The normalized score is calculated on the basis of the following formula. 100 X Number of candidates appeared in the ‘Session’ with raw score Equal to or less than the candidate ➗ Total number of aspirants who have appeared in the ‘Session’. Qs1. 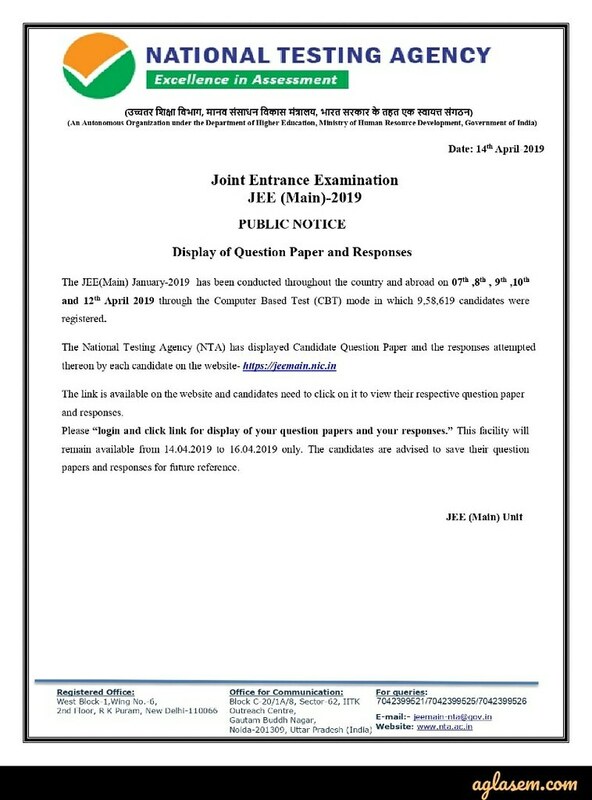 Will NTA send the pdf of the JEE Main 2019 Answer Key at my registered email id? Ans. No, NTA does not send the Answer Key for JEE Main 2019 at the candidate’s registered email id. You have to download the JEE Main Answer Key from the Candidate Login only. Qs2. I appeared for JEE Main 9 April 2019 exam in Shift 2. Will I also get the JEE Main 2019 Answer Key for other shifts exam as well? Ans. No, you can view only your respective exam date and shift Answer Key through the JEE Main Login. Qs3. I have obtained 320 marks using the JEE Main Answer Key by a coaching center. What rank will I get in the JEE Main Result 2019? Ans. It can only be confirmed when the JEE Main 2019 Result is out. However, as per the unofficial sources, with your marks range, you may get a rank between 1-9. Qs4. Will I get my money refund if the objection submitted by me is correct? Ans. Yes, if NTA approves the challenge/representation submitted by you, then the amount of fees paid by you will be refunded. The objection fee will be refunded in the same account from which the payment is done. Below are some more previous year JEE Main Answer Keys. Click here to download for Set B.
Click here to download for Set C.
Click here to download for Set D.